Publisher : TidBITS Publishing, Inc. Many people buy an iPhone or iPad and don’t know how to put it to good use. They know what they know, and they may be afraid to explore further. Others dread the iOS update because the interface may change and they fear being unable to use their device. For those users, and the rest of us, there’s iOS 10: A Take Control Crash Course. The book begins with new features in iOS 10, giving readers a brief overview before going into greater detail later in the book. Note that some of the features mentioned are unavailable on iPhone 6 and previous models. As I read iOS 10: A Take Control Crash Course I followed along on my iPhone 6. Now that I’m the proud owner of an iPhone 7 I’ll go back and reread certain sections, like 3D Touch Tricks, and many other passages I highlighted, that will help ease my transition with the new phone. Screenshots are plentiful throughout, very helpful for visual learners like me. Centers breaks down each topic into mini tutorials, with step by step instructions, making the learning process a breeze. On many topics, Centers links to various resources and other Take Control books for readers who wish to dive in more deeply than the information presented in the crash course. Many chapters are not just great refreshers for experienced iOS users, but are a wonderful primer for users new to iPhone or iPad. Commanding Keyboards is especially useful. Learn about using multiple keyboards, Emoji, and typing basics. A major change in iOS 10 is Messages. Did you know that if you put the iPhone in landscape orientation the Messages screen goes into Handwriting mode? Neither did I! Just one of the many nuggets of information I learned in iOS 10: A Take Control Crash Course. Have you wanted to dip your toe into home automation but have been too intimidated or felt it was too complicated? Centers devotes an entire chapter to HomeKit, including using Siri to set a romantic scene. There’s so much more in iOS 10: A Take Control Crash Course. Learn about the new multi-panel Control Center, the changes and additions in Photos, Slide Over on the iPad, Apple Pay in Safari, adjusting various settings to preserve battery life, and so much more. 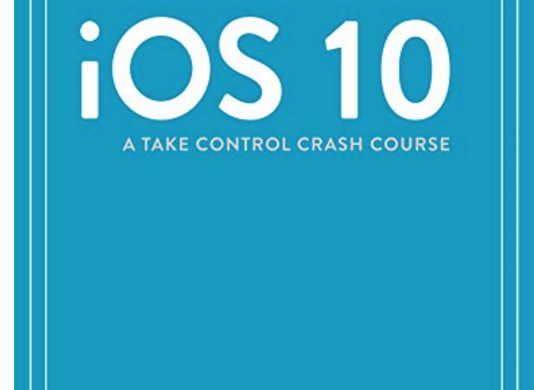 I recommend not reading the entire book in one sitting, as it could be quite overwhelming, especially readers new to iOS. Read the introductory chapters, then either read a chapter every day or two, or read the chapter that pertains to what interests you at any given time. Remember: this is a reference book, and is written so readers can go back to it when needed. It’s no secret that I’m a huge fan of the Take Control book series, including their Crash Course books. 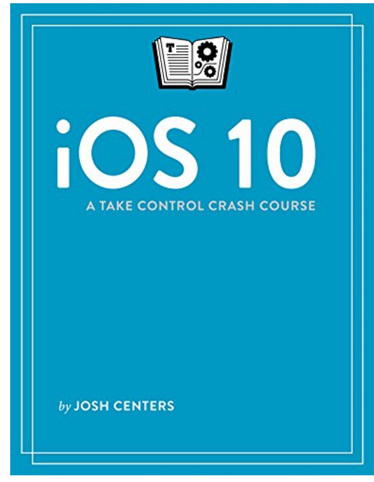 iOS 10: A Take Control Crash Course is another must-have book for your technology library.